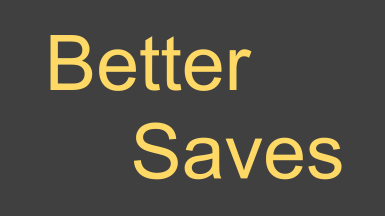 Replaces the vanilla auto save and quick save features. OBSE Required for any part of the mod to function. Replaces the buggy auto save and quick save features with two small scripts. Bug reporting, change logs and source code: GitLab repository. All configurations are made through the BetterSaves.ini file packaged with the mod. Place BetterSaves.esp and BetterSaves.ini in Oblivion\Data. Add the archive to the mod manager and install normally. Might conflict with mods that bind a new function to the quick save and quick load keys. Attempting to quick save or quick load immediately after loading the game will cause the vanilla functions to trigger. Since there is a slight delay after loading the game until scripts start running, this can't be avoided.